I love that every day brings me new people in my life that change my views and inspire me more to do. I met the #BeautyJunkee personally last month. She is one of the most popular beauty bloggers in the Philippines. Over hi and hellos, she shared that she is supporting a new group as part of her commitment to give back to the community. The group is called Network for Enterprising Women (N.E.W), a local organization that empowers Filipinos through Entrepreneurship. I asked her if she can send me the information so I can also help spread the word and somehow help these women with their advocacy. Here I am sharing it with you..
Click Read More to know more about the New Fashion and Beauty Fair.. The group which was established in 2006 has been guiding entrepreneurial Filipinas through workshops and seminars held by some of the country’s notable business gurus that provide them with the right mindset to develop, start, and sustain a business. Some of our successful members are Roseanne and Robina Ko of Status Hair Salon, Edilee Omoyon of Milea All Organics, and Judith Cinco of Imagere Watch Store to name a few. The following esteemed Filipina entrepreneurs are also members of N.E.W: Jen Gerodias- Diaz of Snoe Beauty Inc., Carla Cruz of Franck Provost and Center For Aesthetic Studies, Dr. Mary Jane Torres of Zen Institute, Carrie Rabat of Rieseling Boracay Resort, and Jennifer Tam- Yap of Pure Beauty and MUD. The group has been staging bazaars to support our organization’s efforts and social initiatives. In 2013, N.E.W had succcessfully staged The N.E.W. Fashion and Beauty Fair Year 1 at Rockwell Tent. This year is no different as Network for Enterprising Women (N.E.W.) together with its event partner MBCI, will stage The N.E.W. 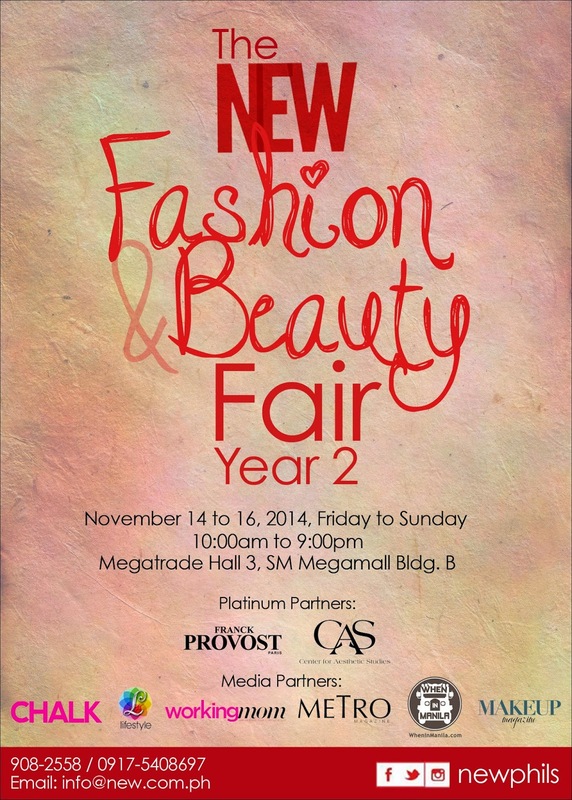 Fashion and Beauty Fair Year 2 on November 14 to 16, 2014 (Friday to Sunday) at the Megatrade Hall 3, 5/F Bldg. B, SM Megamall. What to expect from the N.E.W. Fashion and Beauty Fair Year 2? make-up competition featuring some of the country’s up-and-coming make-up artists. The event admission is FREE! I think it is a good bonding experience for friends and families (esp with mom!) . By shopping and supporting this cause, we are helping the economy and empower one entrepreneurial Filipina at a time.